Use discount code UW2019 for a 30% discount on registration. 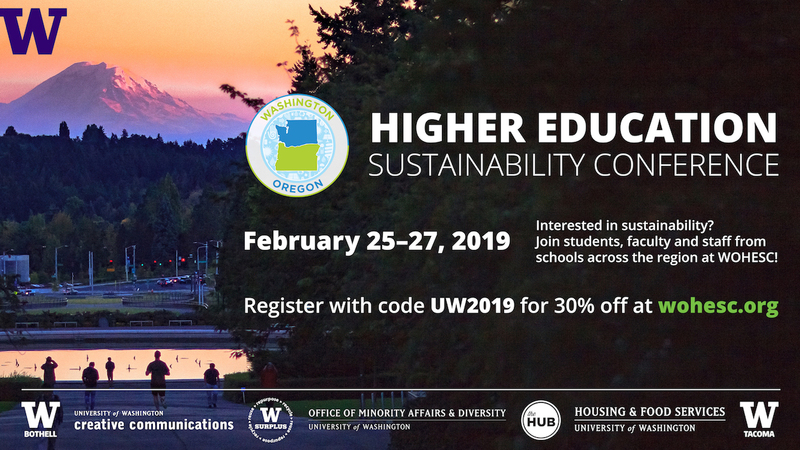 The conference program features many University of Washington students, faculty and staff who will be sharing their experiences and lessons on incorporating sustainability into higher education and beyond in sessions, panel discussions, networking groups and more. 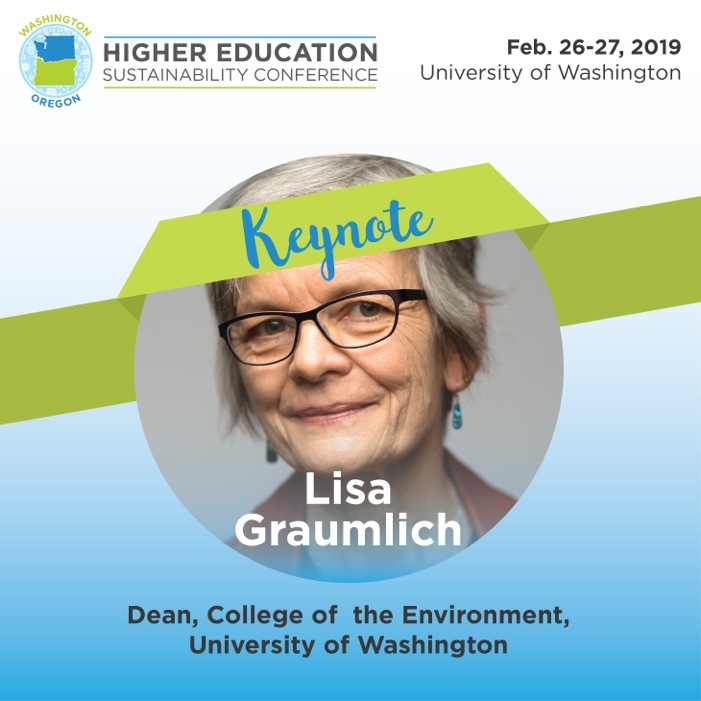 The WOHESC welcome keynote will be presented by Dean of the UW College of the Environment Lisa Graumlich. She is the inaugural dean of the College of the Environment at the University of Washington. As dean, she leads a College with unparalleled depth and breadth in environmental systems: from the forests to the seas and from the depths of the earth to the edges of the solar system. As a scholar, Graumlich pioneered the use of tree-ring data to understand long-term trends in climate, focusing on the mountains of western North America. Graumlich has served as a faculty member at University of California-Los Angeles, the director of the University of Arizona's Institute for the Study of Planet Earth and Montana State University's Mountain Research Center, as well as executive director of their Big Sky Institute. She received her B.S. in Botany and M.S. in Geography from the University of Wisconsin-Madison, and her Ph.D. in Forest Resources from the University of Washington. 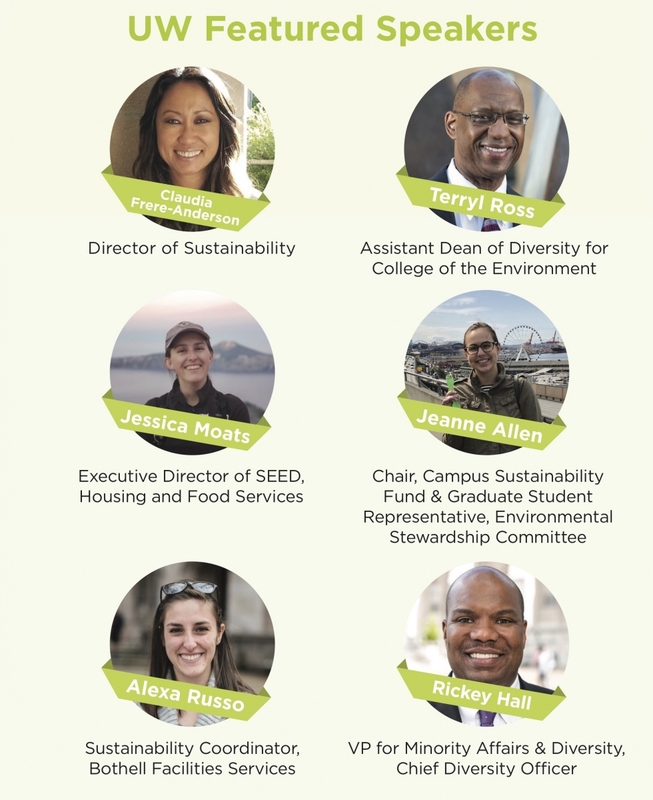 Other UW speakers include UW Sustainability Director Claudia Frere-Anderson, Assistant Dean of Diversity for the UW College of the Environment Terryl Ross, Executive Director of the SEED student group Jessica Moats, Chair of the Campus Sustainability Fund committee Jeanne Allen, UW Bothell Sustainability Coordinator Alexa Russo and UW Vice President for Minority Affairs and Diversity Rickey Hall.